The grenade, crowned, is worn on the button, and on the collar with the tiger and elephant; the grenade on the head dress plate bears, in addition, the arms of Dublin and the regimental motto "Spectamur agendo". The shamrock appears surrounding the arms, and also with the harp, on the waist belt. asked the Secretary of State for War whether the 10th Royal Dublin Fusiliers are still attached to the Naval Division; and, if so, what reason there is for not attaching them to an Irish Division? I recognise, of course, the special interest taken by my hon. and learned Friend and by other Members in the allocation of this battalion, but it is, I fear, impossible to make exceptions to the rule that military information in regard to details of the order of battle must not be made public. The point raised is one for the Commander-in-Chief in France to settle, and I have no doubt that he has done and will do all he can to secure the close association of Irish units, but he must, of course, have regard to paramount military considerations and he must also bear in mind the fact that the principle underlying my hon. and learned Friend's question is capable of very wide extension, and, if so extended, would in effect remove from the Commander-in-Chief a large part of his discretion in regard to the disposition of his troops. The power to use and dispose of troops according to military exigencies and to military exigencies alone is, of course, an essential and indefeasible function of a Commander-in-Chief. May I ask the right hon. Gentleman whether, in view of the fact that serious complaints have been made that Irish reserves are not being sent to fill up certain gaps in, the Irish Division, and in view of the fact that the 10th Royal Dublin Fusiliers was raised as a reserve battalion in Ireland, is it not reasonable for us to ask that they should be sent to the Irish Division? I have no doubt that consideration is present to the mind of the Commander-in-Chief. As a matter of fact, my hon. and learned Friend knows that it was brought specially to his notice, but I made it perfectly clear that the allocation of this battalion must be subject to military exigencies in France, and as the Commander-in-Chief has alone to be the judge of what ought to be done under these circumstances it would be a very serious matter for us to interfere from the War Office with his discretion. Am I to understand that the battalion is not, or will not be, attached to the Irish Division? That is the other question which I postponed at the request of the right hon. Gentleman. This question is simply whether the 10th Royal Dublin Fusiliers are still attached to the Naval Division, and, if so, what reason is there for not attaching them to the Irish Division? My hon. and learned Friend has asked me if I can state whether there is any intention of retaining them in their present position. I clearly could not give an answer to that without consulting the Commander-in-Chief. What have the 10th Royal Dublin Fusiliers to do with the Naval Division? The same question might be put in reference to any Scotch, Irish, English or Welsh men in the Naval Division? 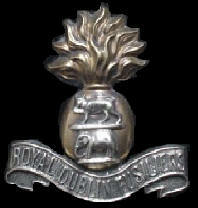 Due to substantial defence cuts, and the establishment of the Irish Free State in 1922, it was agreed under the terms of the Anglo-Irish Treaty that the six former Southern Ireland regiments (out of a total of thirteen Irish regiments) would be disbanded, including the Royal Dublin Fusiliers. On 12 June, the six regiments Colours with the exception of the South Irish Horse who sent a Regimental Engraving, because the regiment chose to have its Standard remain in St. Patrick's Cathedral, Dublin -- were laid up in a ceremony at St George's Hall, Windsor Castle in the presence of HM King George V . The Dublin Fusiliers detachment included the commanding officers of the 1st Dublins and 2nd Dublins, lieutenant-colonels C. N. Perreau and G. S. Higgingson, who had been captured in France during the first year of WWI, and the regiment's Colonel-in-Chief, HRH the Duke of Connaught. The Colours remain there as of 2009.